It took a week. A week for me to grow a beard. 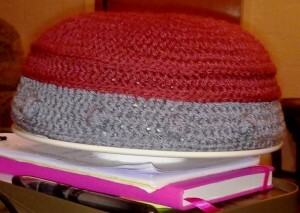 And I made a hat to go with it! That pinky brown semi-circle was the beginning of it. It all began with an email…. That was it. One line and a photo. I have to admit that I was not surprised. I had seen the photo a couple of hours earlier. So me being me, I dragged it out a little…. Me: Who for? How long have I got? It looks like loads of plaits. Elly: George, by Halloween, the plaits look pretty simple, the hat would be the difficult bit, no? Me: You want the hat too? With horns on? Elly: If possible – if not possible then I could look out for a viking hat and the beard could just attach on to it. Me: I would need measurements and wool! What colour? ….copper wire to mould and fit across the chin and round the ears. The beardy bit is the easy part. 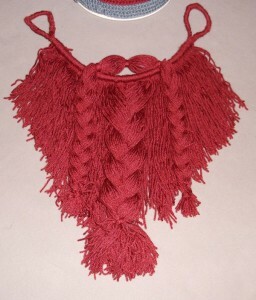 It would be like Macramé. Elly: I like the red beard (in the photo, mind you it looked brown to me. ), the hat colour wouldn’t matter. So back went my basket weave project into the bag and I put my thinking cap on. 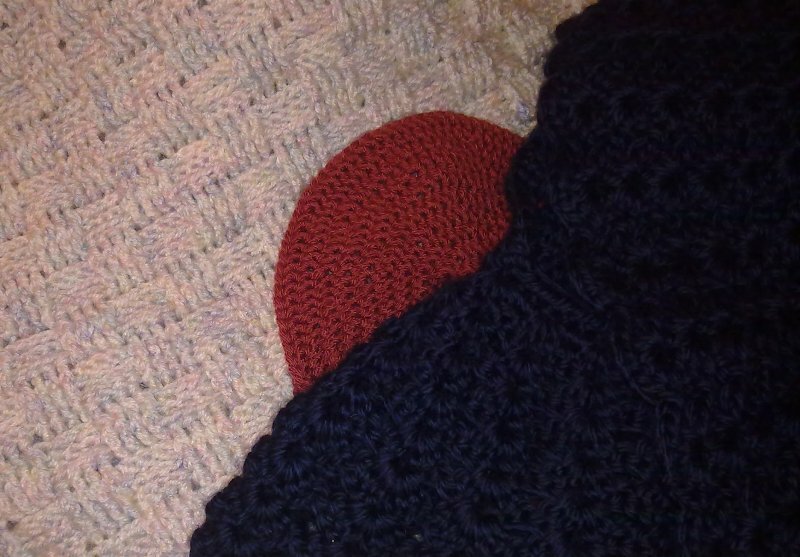 The hat would actually be a beanie and although I had never made one before, it seemed simple enough. I decided to crochet it, and keep as close to the photo as possible. Not the clearest of pictures, but you get the idea. 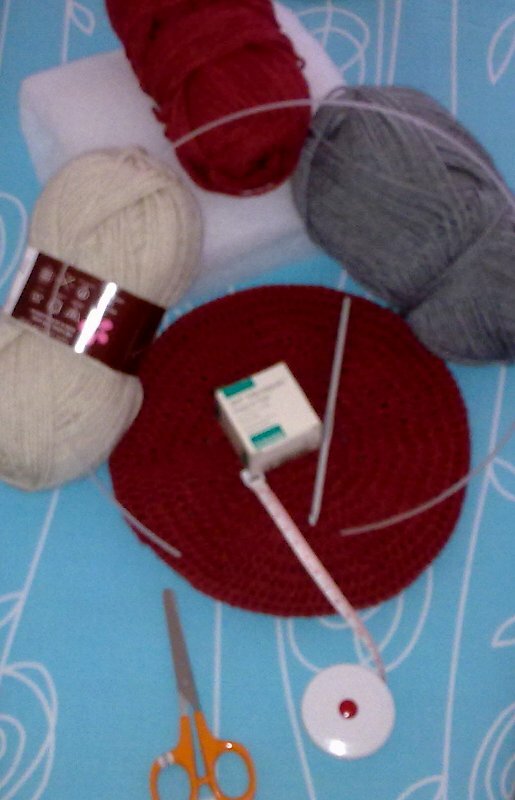 Three colours of wool, some stuffing for the horns, a crochet hook, a packing needle, measuring tape, scissors and a piece if plastic boning left over from making Elly’s Wedding outfit and in the little box – a roll of surgical tape that has lived in the first aid cupboard for years. So days passed and the measurements arrived. I discovered I had a problem. 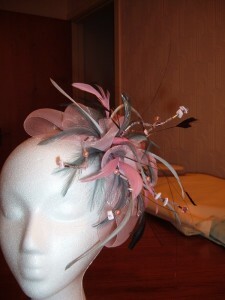 The only head-form I had was the one I used when making my Fascinator for Elly & George’s wedding. It was even on the small side for me then, but I managed. How can I say this without getting into trouble…. George has…. George’s Head is…. My dearly beloved son-in law has a head that is bigger than mine. Phew! Still Friends? I hope. Into my kitchen cupboards with me, and there I found that the smallest of my set of plastic mixing bowls, fit the measurements exactly! One beanie complete with rivets. Now with the beanie hat complete the fun part could begin. I was getting excited. From here on out, it was really make what you see…… three-dimensional. I made one of the horns and once satisfied, had to make the second quickly, before I forgot what I did with the first one. Giving the hat my own stamp, I attached the horns in a different way to the original photo. 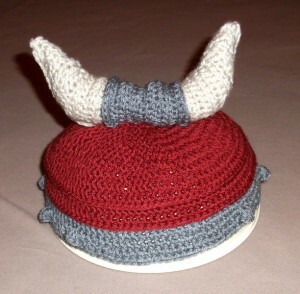 Viking hat with horns attached. The final stage was THE beard. I could see it in my mind’s eye. I ditched the idea of copper wire when I found the plastic boning, so needed another way to connect the beard to the ears. I made a wool loop to go through the beard area and up and over each ear. The boning was to reinforce the shape across the face and under the mouth. Then I got to work looping and connecting the wool to cover this bridge of wool and boning. Then I worked single crochet stitches round the ear circles. I needed to see it in front of me, somewhere that it would hang while I made the moustache and all three plaits. The moustache and side plaits were made as one piece and attached to the beard. 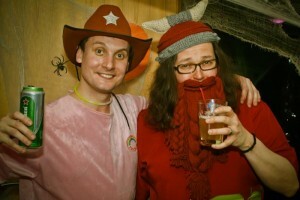 Darren with George the Viking having fun at Halloween. This entry was posted in Crafts on November 7, 2012 by Grannymar.